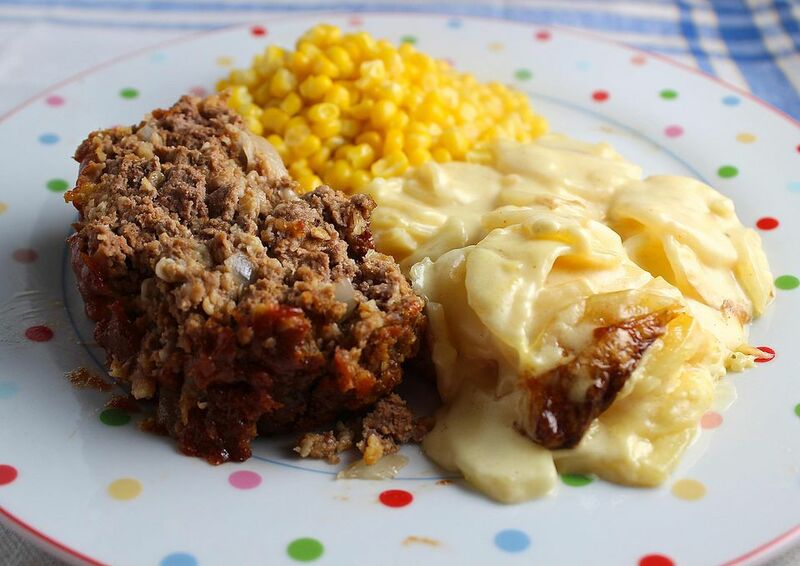 This classic and perfectly delicious meatloaf is the recipe my mom made when I was growing up. It's the one I turn to when I want true comfort food. This is a very simple recipe. It uses oatmeal bread for a wonderful texture and flavor and just adds tomato sauce, eggs, and cooked onion. Serve it with some scalloped potatoes and a fresh fruit salad when it's cold outside. All you need to add to the meal is a dessert; serve chocolate chip cookies or brownies. Saute the onion in the olive oil in a heavy skillet over medium heat until tender. Place the onions in a large bowl and let sit for 10 minutes to cool slightly. Add the eggs, tomato sauce, bread crumbs, salt, and pepper to the onions and mix well to blend. Let stand for 10 minutes. Then add the ground beef and mix gently but thoroughly with your hands to blend. Form the meat mixture into two loaf shapes on a broiler rack with slits and a bottom section for catching drippings. Bake the meatloaf at 350 F for 65 to 75 minutes, until the internal temperature reaches 160 degrees. Make sure that the food thermometer is inserted into the center of the meatloaf for the most accurate reading. And make sure that you are using an accurate food thermometer. Since you are working with ground beef, you want to make sure that the meatloaf is cooked all the way through. Remove the meatloaf from the oven and cover loosely with foil so the juices can redistribute and the temperature can rise a bit. Let the meatloaf stand for 10 minutes before slicing to serve. this is an important step; it helps the meatloaf slice well. To serve 6, cut the recipe in half and form into only one loaf. Bake for the same amount of time. You can also freeze one of the meatloaves unbaked. To bake it, let it thaw overnight in the fridge (NOT on the counter) and bake as directed until the temperature reaches 160 F.